Uniquely Different ~ Crafted for the individual. 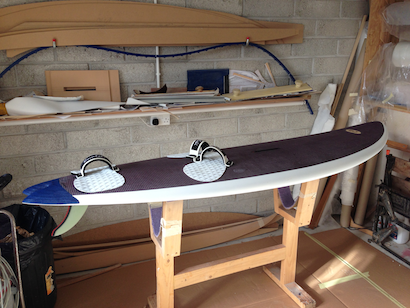 Here’s something a bit different – a light, tough, compact, 92ltr, flex tail, single fin wave board. Why build that? Well the theory is as follows. Multi-finned boards maybe a lot of fun but those fins increase drag. Yes they can generate drive and assist turning etc. but on other points of sail they just add drag from their high wetted surface area and increased turbulence, hence there are no multi finned speed or slalom boards. 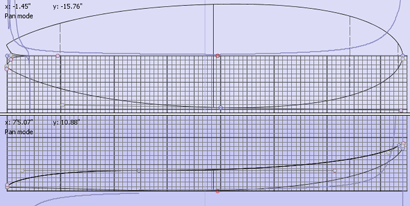 This inefficiency troubles me a little so I’ve revisited an old approach and added flex to improve turning response and paired that with the pure efficiency of a single fin. My target is to combine the many advantages a reduced tail rocker gives on a sailboard (early planing, speed, windward performance, and drive in longer turns) but with the tighter turning benefits of increased tail rocker as needed. I also gain from the pure hydrodynamic efficiency of a single fin and its free flowing feel that I really like. Another particular attraction is the great ease of switching fins to tune for different conditions. This board is primarily designed for use with the fast, stable and free turning Black Project Epic Wave 21.5cm fin (http://www NULL.blackprojectfins NULL.com/products/windsurf-fins/epicwave/) in cross offshore conditions (Gwithian etc.). However I can swiftly swap to the slightly more pivotal Black Project Wave Single 22cm (http://www NULL.blackprojectfins NULL.com/products/windsurf-fins/wave-single/) for side/onshore days (Marazion) and finally the powerful Black Project Freewave 24cm (http://www NULL.blackprojectfins NULL.com/products/windsurf-fins/freewave/) for jumping and general blasting about in weak wave or free ride conditions (Carrick roads, Gyllyngvase). Three easy fin choices that change the feel of one board to cover most of the conditions Cornwall sends my way, with more predictable performance gains and far less hassle than swapping multi-fins about. Singles may not be as “current” as twins, thrusters or quads but nevertheless they still work really well and make a lot of sense for highly changeable UK conditions. Add the advantages of variable tail rocker I think I maybe onto a winner ~ for my needs at least. Black Project Fins Wave Singles (http://vimeo NULL.com/58132567) from CJ Surf (http://vimeo NULL.com/user5680196) on Vimeo (http://vimeo NULL.com). I really enjoy my “Maza Fish” quad design and that was the starting point for this board. 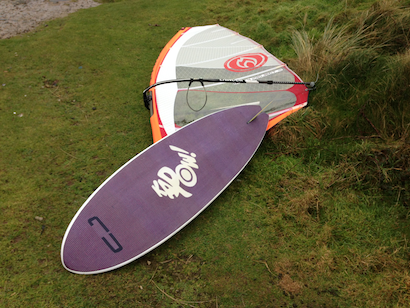 That board was intended primarily for summery 5.7m weather but even so I’ve ended up using it a lot in high winds and in some decent sized waves simply because of how user friendly it is. This new smaller board is to be my board of choice for most of the 4.7 to 5.3 days. “Kapow” has a modified outline and is narrower and shorter at just 2.26m x59.5cm (Maza Fish is 235 x 61.5). I’ve increased the nose rocker to add ease and confidence in chunkier conditions and to bring more rail rocker curve into the forward entry of the board to further improve turning and manoeuvrability (the entry rail rocker has a large effect on turning due to the way it drives the front of the board round when the forward rail is engaged); otherwise the rest of the rocker line follows a similar but mildly increased curve. The negative side of this entry rocker is that the board will be a bit more “sticky” when stood forward slogging out in lulls, and to help offset this I’ve kept plenty of volume up front so that it rides high at slow speeds and to compensate for the reduced length. I’ve then carried as much volume as I dare through into the tail so that I can get quickly back and “pop” the nose up and away in a gust to get into planing mode. Underneath we have a fairly standard double concave running into v which gives excellent chop control, tracking and planing. Careful carbon/dyneema laminates, Textreme reinforcements, minimum paint and no filler has the weight down to a respectable 7.00 kg fin, straps and all. The unusual bit is the modified swallow flex tail configuration that allows each side of the tail to flex differently in response to rider input, so that the inside edge can curve more into a turn whilst letting the outside edge stay straighter and continue to provide more drive. Over the years I’ve dreamed through all manner of whacky ways to add flex into a board in only the places where I want it (if the whole board bends it’s simply horrible to sail) but the great challenge is achieving this without adding excessive weight, complexity, or fragility. Flex Tail 2013 (http://vimeo NULL.com/58114314) from CJ Surf (http://vimeo NULL.com/user5680196) on Vimeo (http://vimeo NULL.com). Does it work? Yes! It’s early days but after half a dozen outings in varied conditions it’s clear that the board has the driven, less skatey single fin style that I like but also turns very well, is fast, responsive and romps upwind. As you might expect it’s sensitive to back foot pressure and I’m having a blast learning the board and how to trim my weight inputs. The low weight is an added bonus when coupled with my lightweight Hotsails Firelights (http://www NULL.hotsailsmaui NULL.com/sail NULL.php?uid=18) and Chinook (http://www NULL.chinooksailing NULL.com/products/) rig components. Everything feels highly responsive and less fatiguing due to the lower inertia. 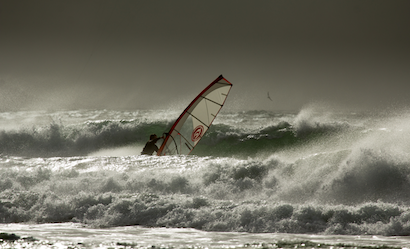 I’m not claiming any revolutionary game changer here; it’s simply an interesting project resulting in a super fun board to sail in a wide variety of conditions. My abilities limit it’s performance rather more than the reverse. A dedicated tri/quad version could be awesome as well, so maybe…..